In his exclusive driver column, the Supercars champ looks back at the Grand Prix, why F1 isn’t as good as it was, and gets ready to tackle Symmons Plains this weekend. It’s been a bit of a break from racing – well, for the Supercars championship anyway – from Clipsal until next weekend when we’re at Symmons Plains. I did the Sebring 12-Hour in America last month and then we had the Australian Grand Prix races, but it’ll be good to get back into the proper championship this weekend. The GP weekend was OK in parts and a bit average in others. The boys in the garage unfortunately had a pretty busy Friday night because of the shunt I had in the second race which you would have seen. I was in fifth and I had Chaz (Mostert) behind me, and I saw him under brakes at Turn 15 and gave him a little bit of space. He was nowhere near close enough and turned me around, and then you’re sitting there facing the wrong way trying to stay out of trouble and hoping nobody hits you. James (Moffat) was tucked up behind ‘Lowndesy’ (Craig Lowndes) and he never saw me, and hit me head-on, we were both just unlucky. A bit of a mess, and it was shame the boys had a late one from something I didn’t have a lot to do with. Quite a few people in the Supercars paddock want the Grand Prix races to be a championship round, but I don’t really mind which way it goes in the future, although I hear there’s some talk that it could become a proper championship round maybe as soon as next year. A non-championship round is fine as it is, but there’s a lot of money spent that weekend, so maybe it would be good for it to count. We get bugger-all testing time, so to get some time on track was definitely useful at Albert Park, and we got to use the new Dunlop supersoft, which was good as most of the races for the rest of this year are soft-tyre races, there’s only a couple of hard-tyre ones. So it was quite a good learning weekend for that. The sprint races at the GP can be a bit standard and sometimes not a lot happens, so if we were to go championship races there in the future, maybe a race length with pit stops would be better. I think we had that five or so years ago at the GP, fewer races but longer ones, and the racing was awesome when you added a strategic element to it. So if we go down that path in the future, that’d be the best option. 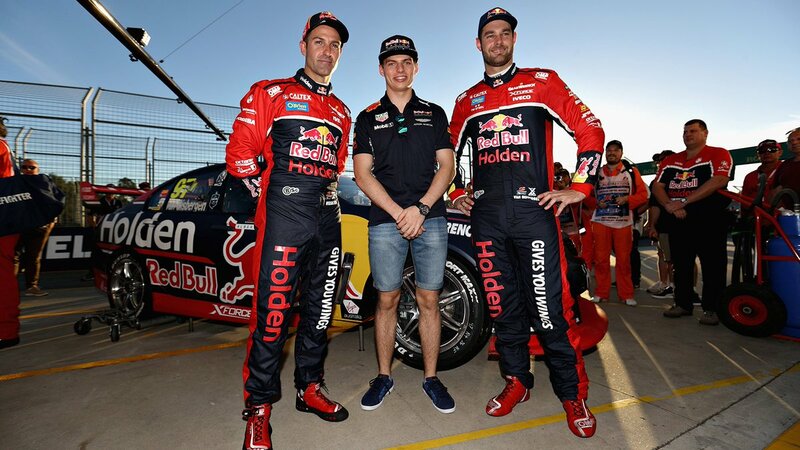 With the F1 boys in town and because of the Red Bull connection, Jamie (Whincup), Craig and me got to have a look at the Red Bull F1 garage, and Max Verstappen came to ours to see our Supercar set-up. He told us he was a fan of our sport and watched the races when he could, and he had a sit in my car and played around with it all. Asked a lot of questions too, wondering if I left-foot braked (and I don’t, I’m right-foot). We talked about heel and toe, and he didn’t even know what that was … he’s definitely had a pretty different background, and he’s so young still being in his third year of F1 and not even 20 years old. There’s even younger drivers than him now, so he’s started something and people are looking for even younger drivers to find the next top-line guy. It was good to show him around. I got to see some of the new F1 cars on track, and they definitely look awesome now with the big rear tyres and the lower rear wings, they’re a big improvement. They look the part and they’re impressively fast, but I still think they sound pretty average, the 10-year old Minardi two-seater that they use around there was an average car back then, but it still sounds 10 times better than the current cars. The performance of the new cars is impressive though, and across the back at the chicane they were pretty awesome. Pole being a 1min 22secs around there, that’s the fastest ever. But for me it doesn’t matter how fast they are, the racing was still not as good and they don’t sound as good as they could, so for me, F1 isn’t the spectacle that it once was. I had a pretty cruisy week after the AGP, but it’s about time to head down to Tassie for our next round this weekend. It’s been a good track for Triple Eight over the years, and I was really quick there last year but got a bit unlucky and made a mistake that got talked about quite a bit on Sunday (we don’t need to go back there), but otherwise our weekend there was good. It’s such a short lap around there being just over 50 seconds, so in some ways there’s some similarities with some of the tracks I raced on back in NZ, but none of them are as simple as this one. There’s only three real sections of corners so you think there’s not a lot to it, but the margins are really fine there and it’s critical to get them right. It’s so easy to get buried in the pack there, you make one tiny mistake in qualifying and it can cost you 15-20 grid positions. Half a tenth of a second either way can mean a row or two further up or down the grid, so it’s a pretty high-intensity lap. Shane was speaking to Red Bull Australia motorsport editor Matthew Clayton.